IDENTIFY THE DOCTRINE(seeing a visual): Write on the board, “I have been sent to earth to gain a ________ and to be tested.” Invite a child to come to the front of the room and draw his or her body on the chalkboard or a large piece of paper. Ask the children to tell you what the drawing is (a body). Fill in the blank and have the children say the sentence together. 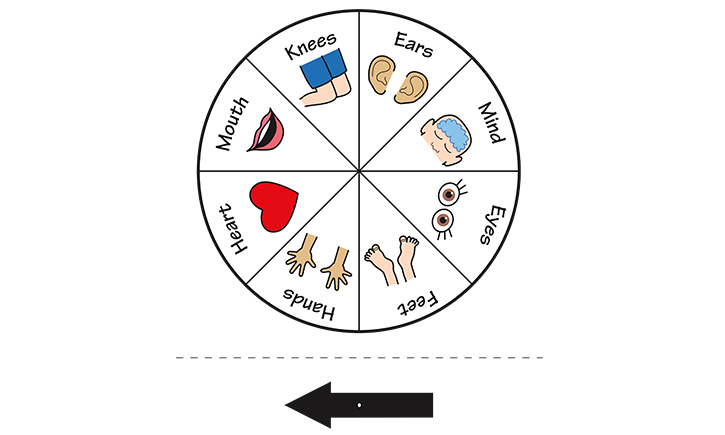 ENCOURAGE UNDERSTANDING AND APPLICATION (participating in a physical activity): Make a spinner displaying pictures of several parts of the body (click here). Discuss several things that our bodies can do, and invite the children to do them with you (for example, wiggling your fingers, stomping your feet, and turning around). Explain that one reason we came to earth was to be tested to see if we will use our bodies to obey Heavenly Father’s teachings. Invite the children to take turns spinning the pointer and telling how they can use the part of the body indicated to obey Heavenly Father. (If you cannot make a spinner, point to different parts of your body and ask the children to tell you how they can use that part of their body to obey Heavenly Father.) Invite the children to sing “I Have Two Ears” (CS, 269). DRAWINGS: Encourage children to show and discuss their pictures with their families. This will help them remember what they have learned. It will also give parents an opportunity to discuss gospel principles with their children (see Teaching, No Greater Call p. 167). Sharing Time Ideas from Little LDS IdeasI think the ‘Identify the Doctrine’ idea from the outline is great, and I know the children will love doing that. I have a few ideas that you could use for this week’s Sharing Time if you’re looking for any. Here they are! Body Punch-A-Box: Yep, I’m bringing this one out again. It’s such a great activity and attention getter, and the children LOVE it!Need to know what a punch-a-box is and how to make one? Then click here. How To Play:Invite a child up to the front and have them ‘punch-a-box’. Have them retrieve the paper from in the box and answer the question.In each box you could have several different types of questions. Here are some ideas:· Have different scenarios that discuss different ways we can obey and then have the children tell you which part of the body they would use. Example: You decide to read your scriptures. Which body part would you use?You help your Mother do the dishes. Which body part would you use? · Have several different parts of the body written on pieces of paper (or use pictures) and have the children come up with an action and then have them act it out (Charades). · Have several different parts of the body written on pieces of paper or use pictures. Have the child read the part of the body and then have them draw it and have the children guess what it is. Then have them share a way they could use that part of their body to obey Heavenly Father. · Have several different parts of the body written on pieces of paper or use pictures. Have the child read the part of the body and then give clues to the other children what they would use that body part for.Example: I use this to see, to read, etc. · Or use all of the above! This is a great way to use the same parts of the body over again since each is a different activity. Charades: Have different actions telling how they can use different parts of the body to obey Heavenly Father written of pieces of paper. Place the pieces of paper into a container and have a child come to the front and pick a paper out of the container. Have the child act out the action and have the other children try to guess what they’re doing and which part of the body they are using. Go Fish! : This would be great for Jr. Primary. Print out several pictures of different types of fish. On the back of the fish attach a picture of different parts of the body. Place a paper clip at the mouth of each fish.Get a small dowel or stick and tie a string to it and attach a magnet to the end of the string.Have the children go fishing. Once they catch a fish have them flip it over. Then have them tell everyone how they can use the part of the body indicated to obey Heavenly Father. Alright, I hope my ideas can help some of you out. I would love to hear what you decide to do and if you come up with some other way to play.I hope you all have a wonderful week, a lovely Valentine’s Day and a Great Sharing Time!